Bald eagles like grizzly bears are pretty good at catching a meal. 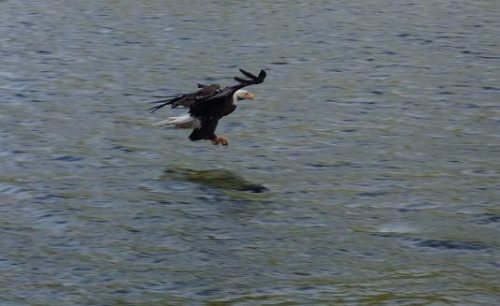 This bald eagle manages to pick up a small salmon which will keep it’s young happy for a little while until they start to squawk again. Always hungry and never satisfied. Date on photo 9/3/2015 11:05 AM Sorry that today’s and the last three posting “Date on photos” are not in time sequence but it makes for a better flow in blogging. But it was an excellent day grizzly bear watching and I quite counting the number of bears when I reached twenty. 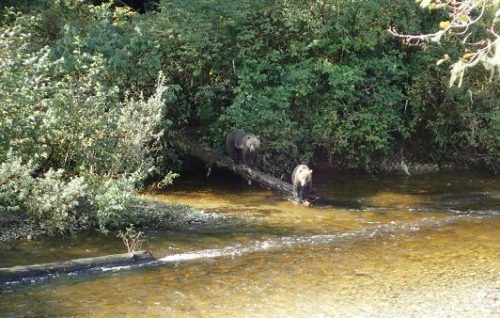 This is the back side of the stands that face the natural river and the area from which most of the bears arrive to fish near the platforms. Date on photo 9/3/2015 10:47 AM. This view is from the end of the platform that faces part of the natural river and the entrance to the pool containing all the salmon. 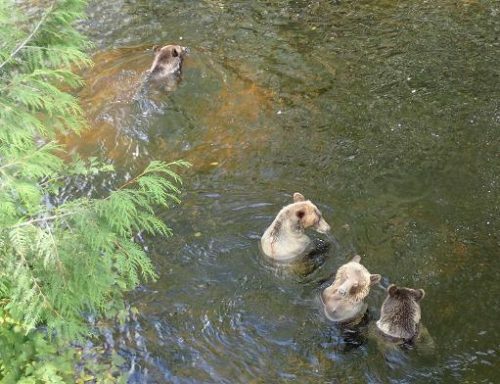 Often bears that are walking up river reach the pool to find that it may contain a large male they do not wish to confront. They by pass the lower pool and walk under the platform to move further up the pool before entering the water again. And for some reason the guests do not mind. 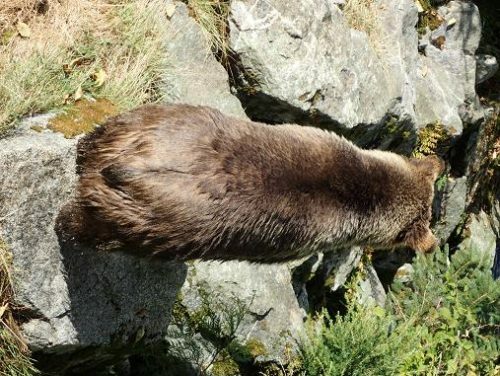 Date on photo 9/3/2015 11:40 AM These grizzly bears are about nine meters (yards) below the front of the platform. If you have any kind of a telephoto lens you will be able to tell the colour of their eyes. Date on photo 9/3/2015 11:20 AM View one is looking to the right toward the entrance to the spawning channel and the weir which maintains the water level. I count seven grizzlies. But then I know that there is one close to the river bank where the rocks and white water are just below the grizzly standing at the weir. Some of these are “binocular bears” but the ones in tomorrow’s post are not…. 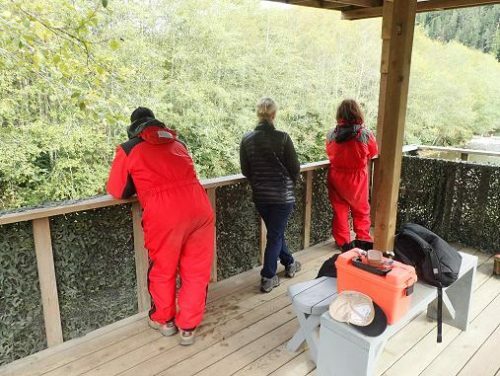 This is the viewing platform we use on Knight Inlet’s Glendale River after August 24th. It is a larger platform which has ample room for guests to move around and not be bumping into each other. Lots of room to set up a tripod and stable enough so there is no movement. Also covered so it is dry and also out of the sun on the hot days. The view from the stands will be in the next four posts…. Grizzly bear watching prior to August 25th is also on the Glendale River but it takes place from a flat bottom skiff that allows us to move through the river and its estuary in very shallow water. 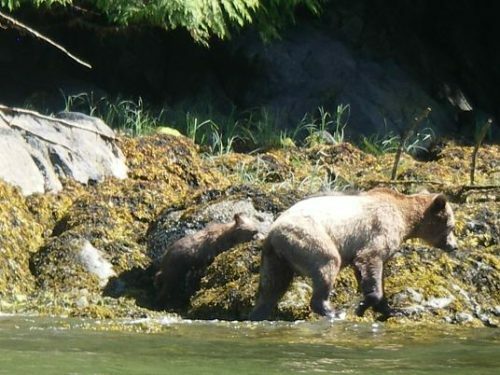 In this case a mother grizzly and her cub are walking the beach and turning over rocks in search of protein in the form of crabs, clams, barnacles, amphipods and other tiny invertebrates. Note the photo is from eye level which is different that the downward view of viewing stand photographs. This photo is the extreme of the point I want to make in this post. 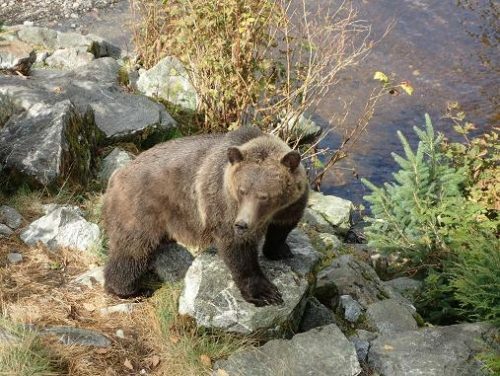 Grizzly bear watching after August 24th takes place from viewing stands on Knight Inlet’s Glendale River. All photographs will have a downward angle as we are higher than the bears. 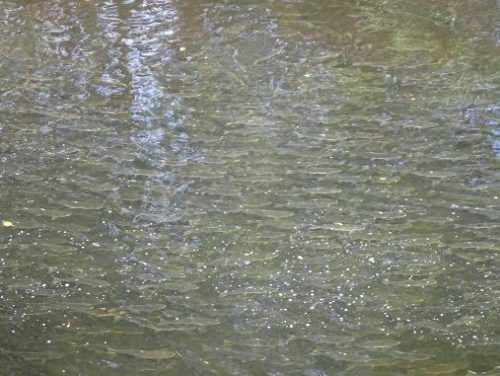 They are either in the water catching salmon, walking the shore or approaching the viewing stands or in this case directly below the stands. 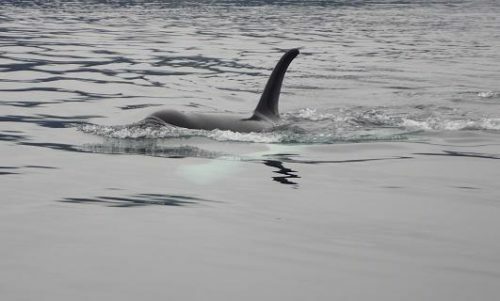 A killer whale / orca’s working speed is much faster than a humpback as it is looking for salmon. This orca had been circling the area of our boat as we sat and watched it feed. This time if surfaced under a “full head of steam” before it dove again nearer the boat to continue it’s search for food. Again as in January 17th post my guests did not complain. This photo is the reason that Grizzly Bear Lodge exists. 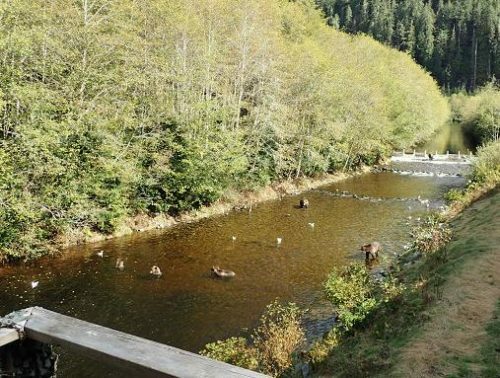 If there were no fish in Knight Inlet’s Glendale River there would be no reason for the grizzlies to come to the area and therefore no need for the lodge to serve the guests to view the bears. 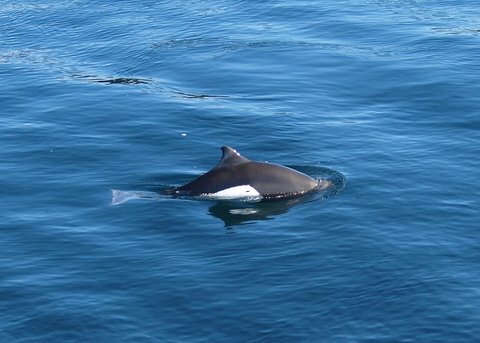 Also the lack of salmon along the coast means the killer whales and fishermen would move to an area of plentiful food. This is the view from the grizzly bear viewing platform we use on the Glendale River.